MIAMI, July 31, 2018 Carnival Cruise Line today revealed plans for a nearly $200 million bow-to-stern makeover for Carnival Triumph in the spring of 2019 that will include renaming the ship. The ship will join Carnival's Sunshine Class and will be named Carnival Sunrise after a two-month-long refurbishment that will take place in Cadiz, Spain, starting March 1. The dry dock makeover will add all of Carnival's wildly popular branded food, beverage and entertainment innovations, as well as update all staterooms in a broad spectrum of new accommodations providing guests fresh and exciting seagoing vacation choices. Febr.3-2014 Carnival Triumph Cruise Ship KATC reports that the infamous "poop" cruise ship, the Triumph, lost power as the Carnival cruise ship was sailing from Cozumel, Mexico back to Galveston, Texas. According to KATC, Carnival says that the Triumph lost power "for eight minutes" after an electrical breaker failed. Carnival says the loss of power "affected ventilation in the ship's incinerator, sending smoke into limited areas of three decks." Everyone will remember the Triumph which floated around in the Gulf of Mexico last year after an engine room fire knocked out power to the ship. Whatever happens with this infamous cruise ship will forever be closely monitored. Carnival denies that a fire broke out on the ship and denies that a fire caused the electrical outage. We have heard these denials before, like this case and this one too. Febr.10-2013 Carnival Triumph experienced an engine room fire while the vessel was sailing approximately 150 miles off the coast of the Yucatan Peninsula. The ship’s automatic fire extinguishing systems activated and the fire was contained to the aft engine room. At this time, the fire is fully extinguished. No casualties or injuries to guests or crew have been reported. The vessel is currently without propulsion and the ship is operating on emergency generator power. The ship's technical crew is continuing to assess the damage and attempting to restore power. In the meantime, a tugboat is being dispatched to the ship's location in the event it is needed. All appropriate authorities including U.S. Coast Guard have been notified. A tugboat is en route to the ship's location and will tow the vessel to Progreso, Mexico, which is the closest port to the ship’s current location. This will enable us to disembark guests and get them home as quickly as possible. The ship is expected to arrive in Progreso Wednesday afternoon and guests will be flown from there back to the U.S.
Update Febr.14Towed by three tugboats, the ship arrived at terminal in Mobile, Alabama, around Thursday 4 p.m. eastern time . It's been a nightmare five days for the 3,143 passengers and 1,086 crew members on board where a fire broke out in the engine room early Sunday. Much of the ship's electrical power went down in the fire, causing widespread malfunctions, including taking out sanitary systems. Passengers have reported sewage sloshing around in hallways, flooded rooms and trouble getting enough to eat. "It's disgusting. It's the worst thing ever,said the passenger. 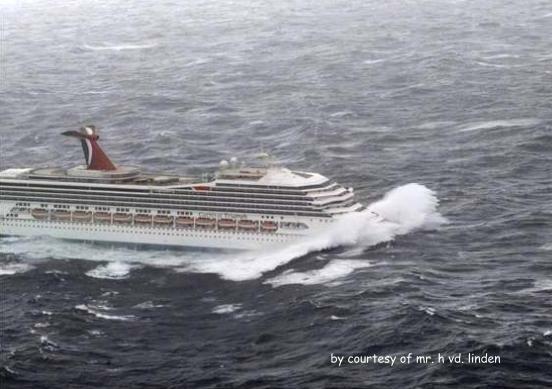 In 2010, the Carnival Splendor lost power after an engine room fire, leaving it drifting off the Pacific coast of Mexico. Splendor is a slighty bigger but it is the same basic design as the Triumph. Carnival has canceled a dozen voyages scheduled between February 11 and April 13. June 2013 Following extensive enhancements and upgrades, Carnival Triumph arrived in Galveston yesterday and will return to service June 13-2013, resuming its year-round schedule of four- and five-day cruises to Mexico. Oct.-2008 Add balconies to a number of cabins on three ships during upcoming drydocks over the next few months. Staterooms on the Carnival Triumph,Carnival Destiny and Carnival Liberty that currently feature floor-to-ceiling windows will be retrofitted with private balconies, creating a total of 48 additional 230-square-foot verandah staterooms on these vessels. Entered service: 1999 - Refit:2008 - Gross Tonnage: 101.509. - Passengers lower beds: 2758.- All berts: 3473 - Passenger decks: 13 - Length o.a. : 272,20 m. - Beam: 35,42 m. - Drive: diesel/electric - 6 Sulzer diesel engines Type ZAV 4pcs. 16 cyl. - 2pcs. 12 cyl. - Total installed power: 63.360 kW. - Propulsion: 2 ABB electric motors of 17.6 MW. each - Service Speed: 20 knots - Max.22.5 knots. - Flag: Bahamas - Classification: Lloyds Register.- Builder: Fincantieri-Italy - Yard no. 5979. 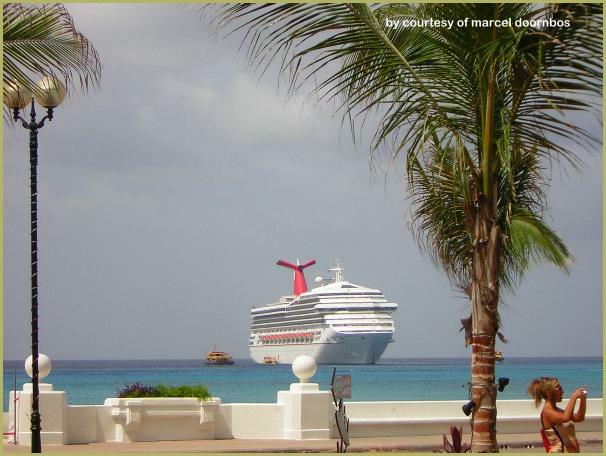 Carnival Triumph and Carnival Victory are slightly different from the Destiny. However all three are called Destiny class.